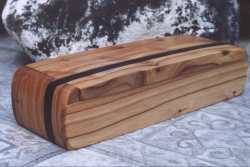 Images are thumbnails and can be clicked to see larger image. All storage units shown below have been assembled in a manner that allows for a continuous wood grain around all four mitered corners. 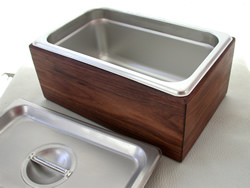 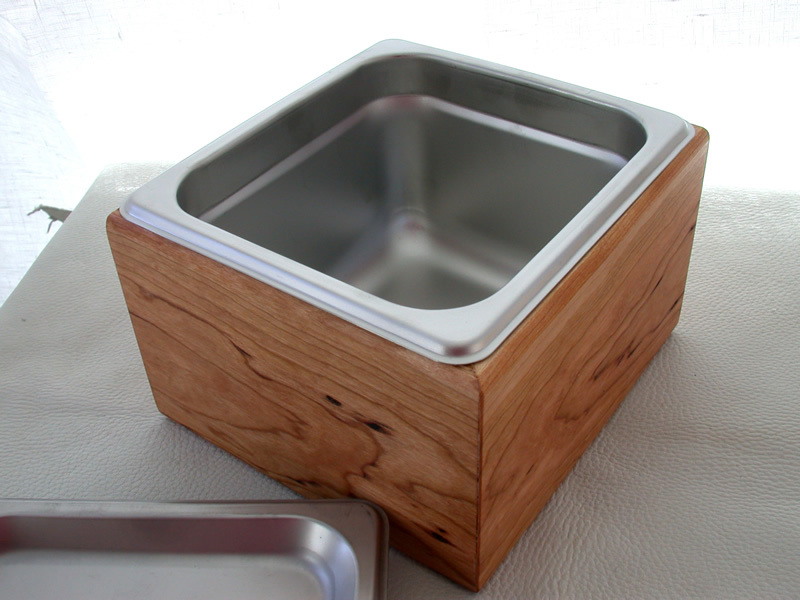 Stainless Steel inserts are commercial restaurant quality. 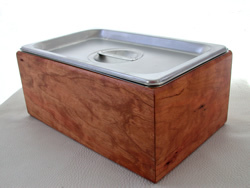 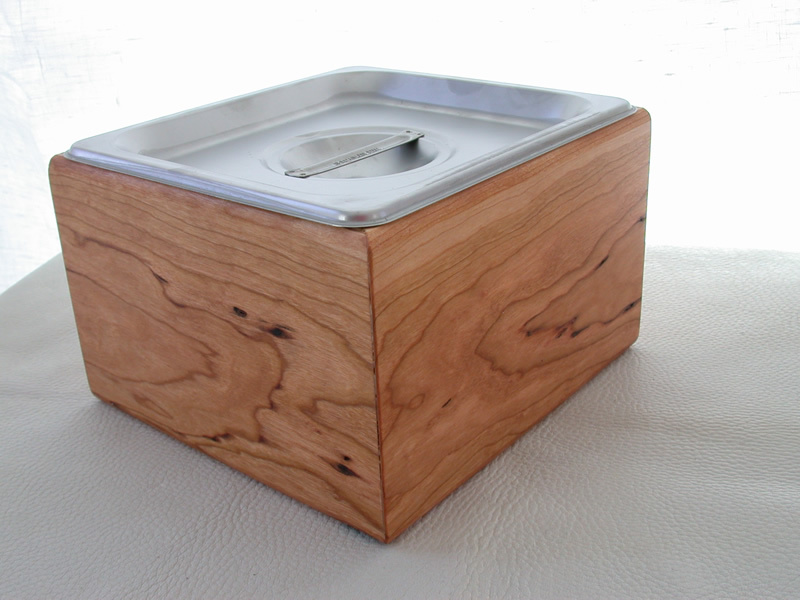 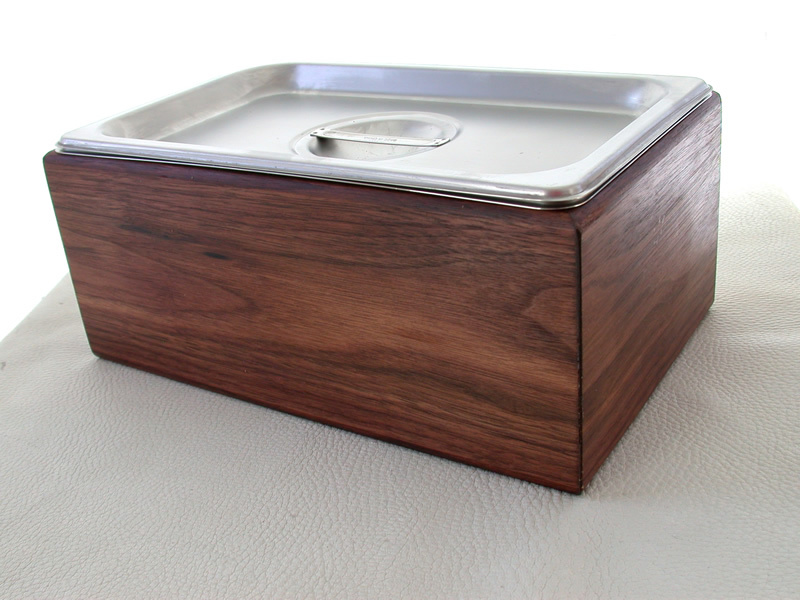 While the stainless steel units are very functional in any kitchen, the wood housing adds a warmth and elegance that steel cannot provide to the home. 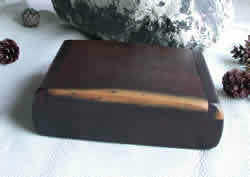 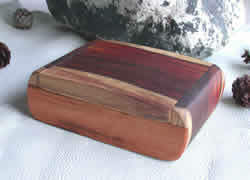 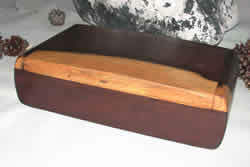 he largest is 7"W X 12.75"L X 6.25"H, The deepest are 6" inside depth. 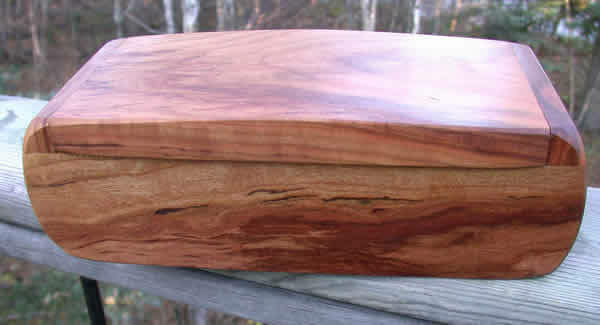 Others are 4" inside depth. 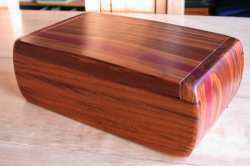 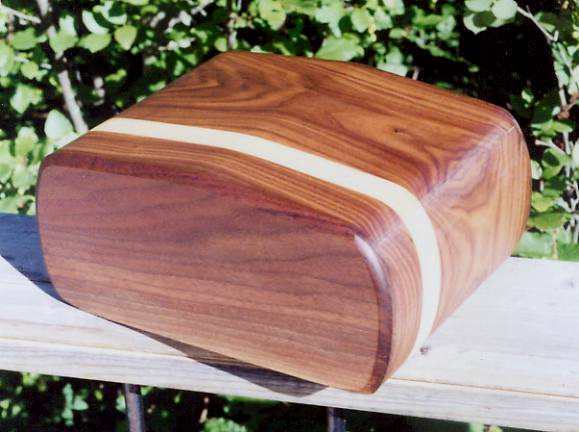 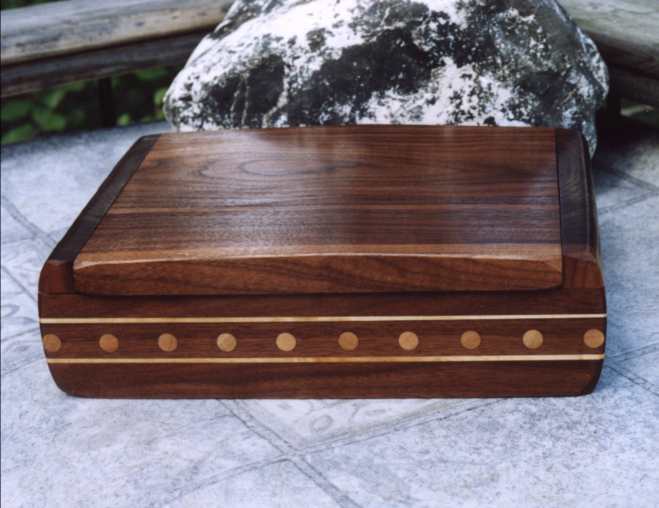 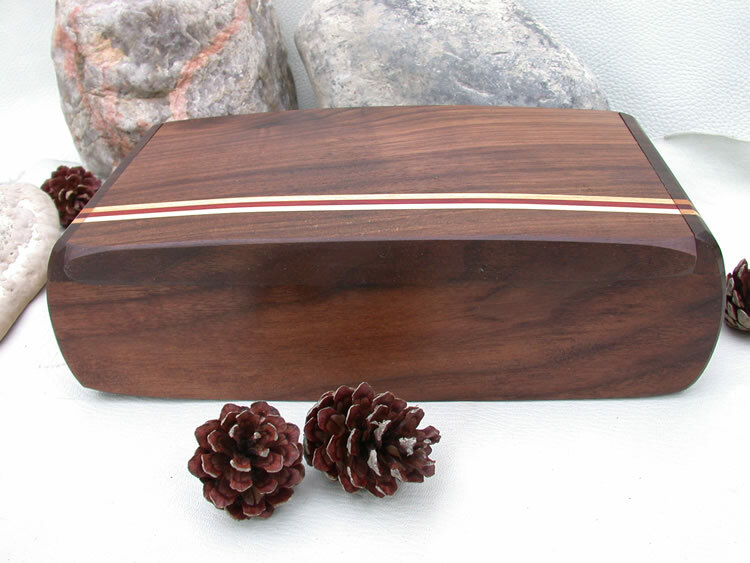 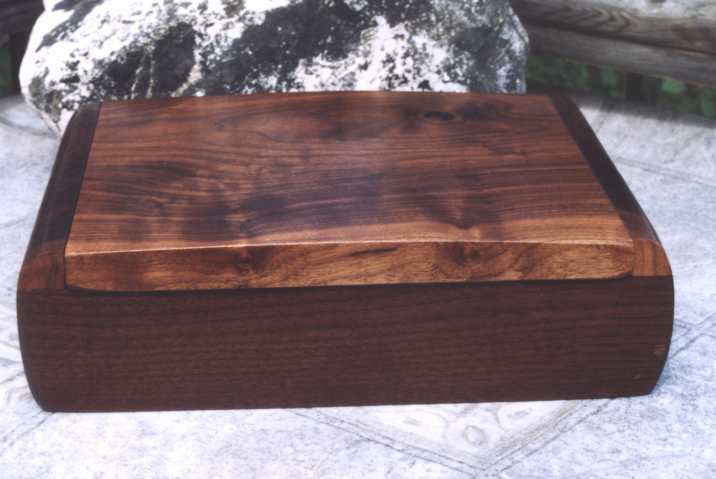 These are in both Cherry wood and Black Walnut. 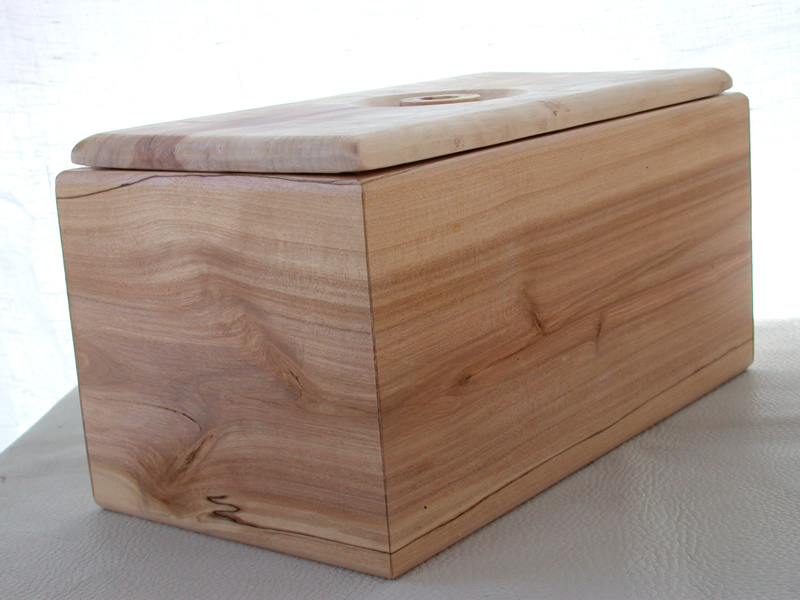 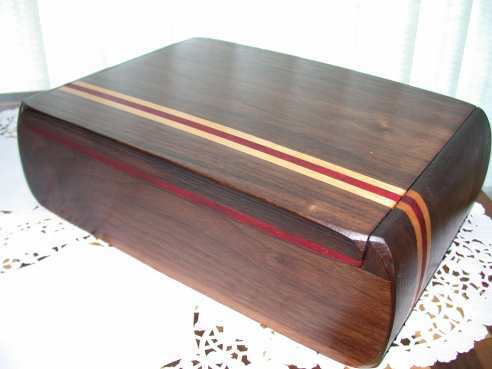 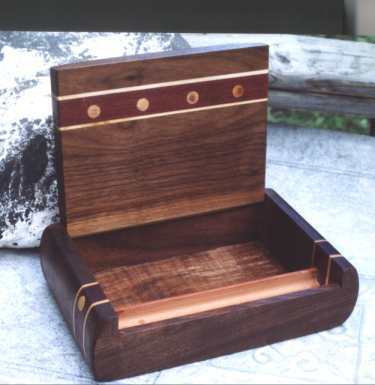 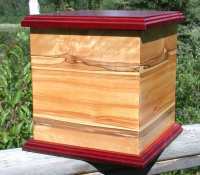 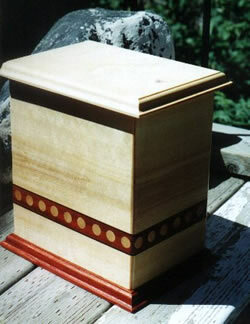 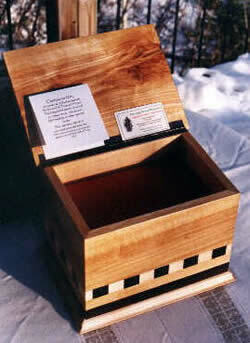 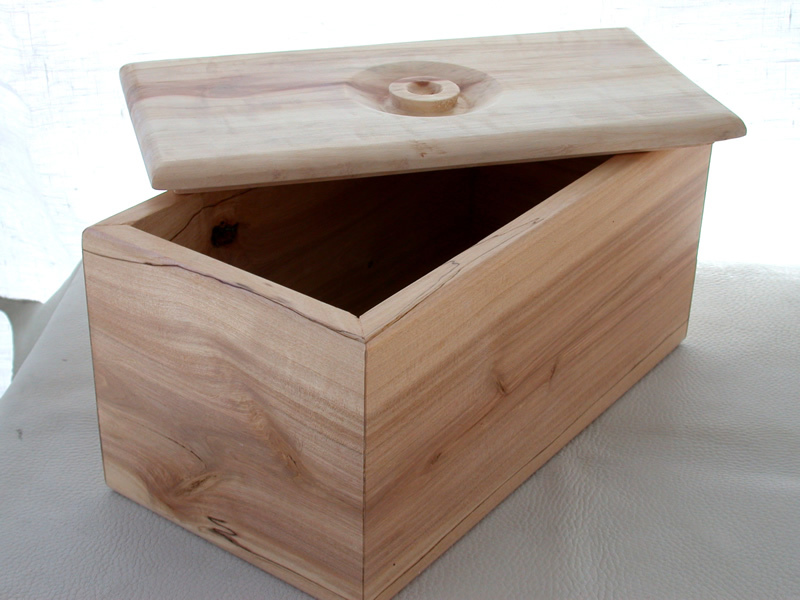 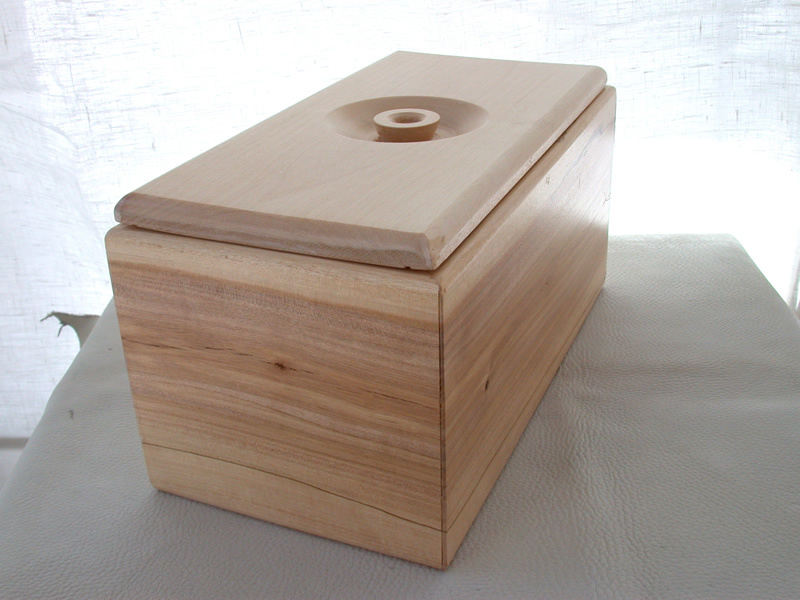 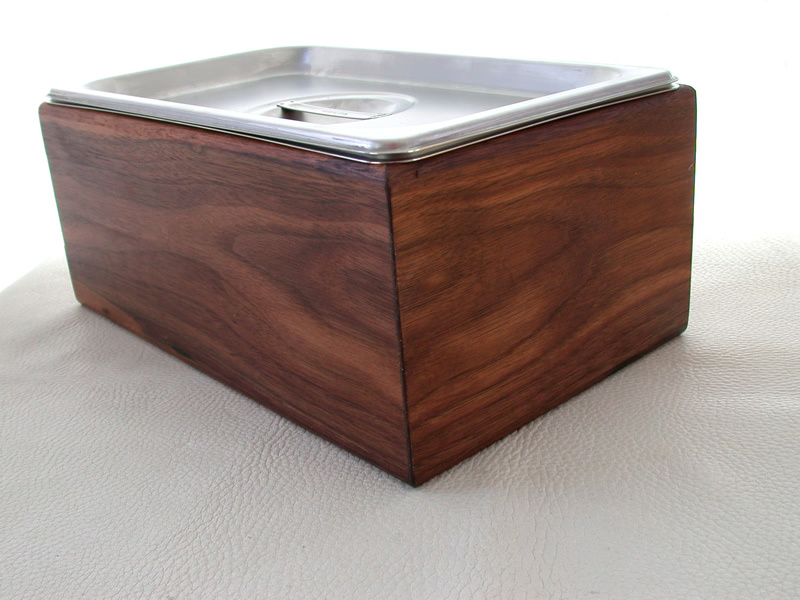 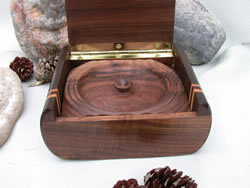 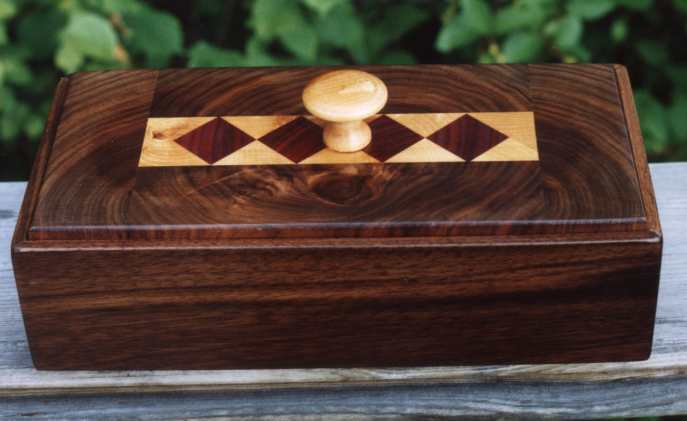 A smaller unit that measures 7" L X 4.25" W x 4.25" H in Cherry wood completes the variations. Contact Gerald about current availability and costs for customization. 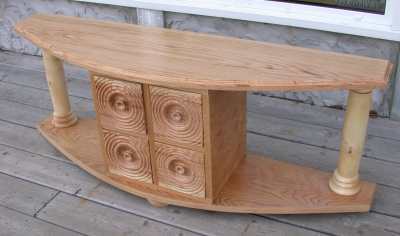 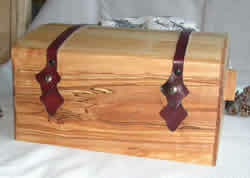 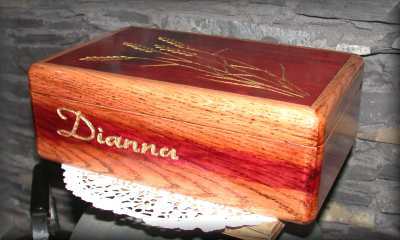 Other types of wood can also be used as requested by a customer. 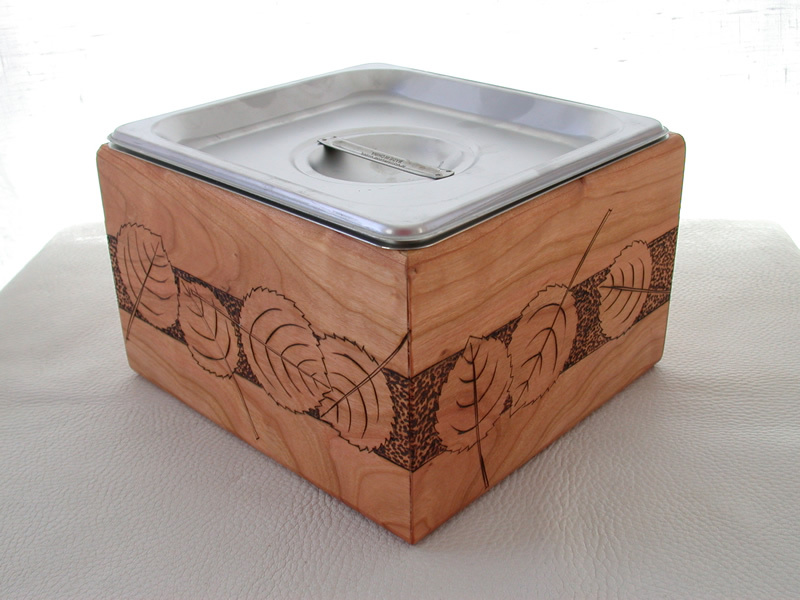 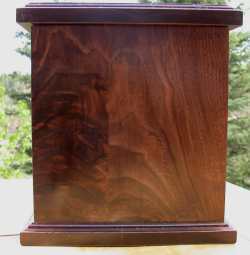 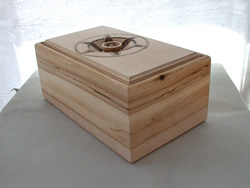 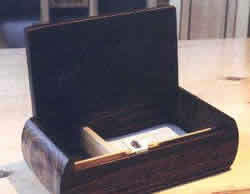 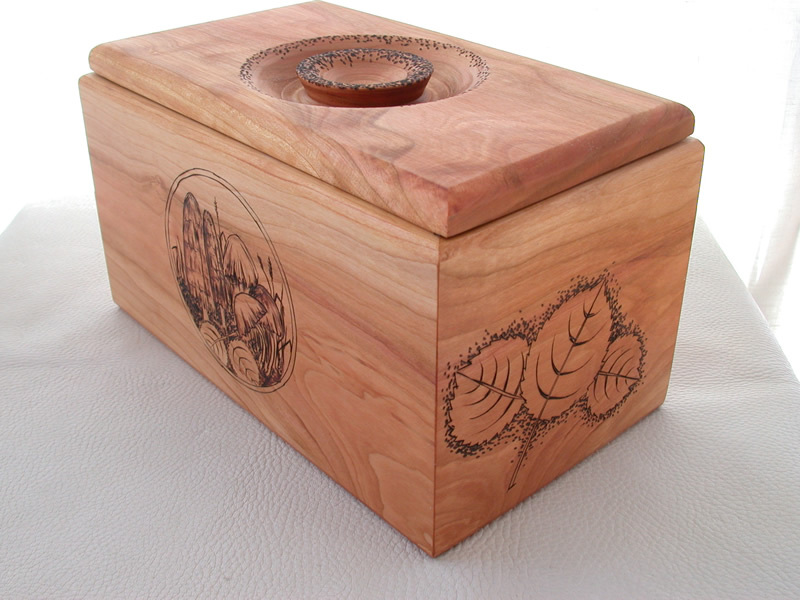 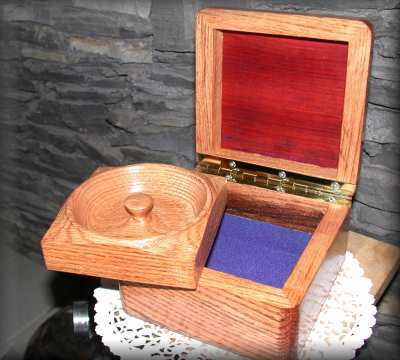 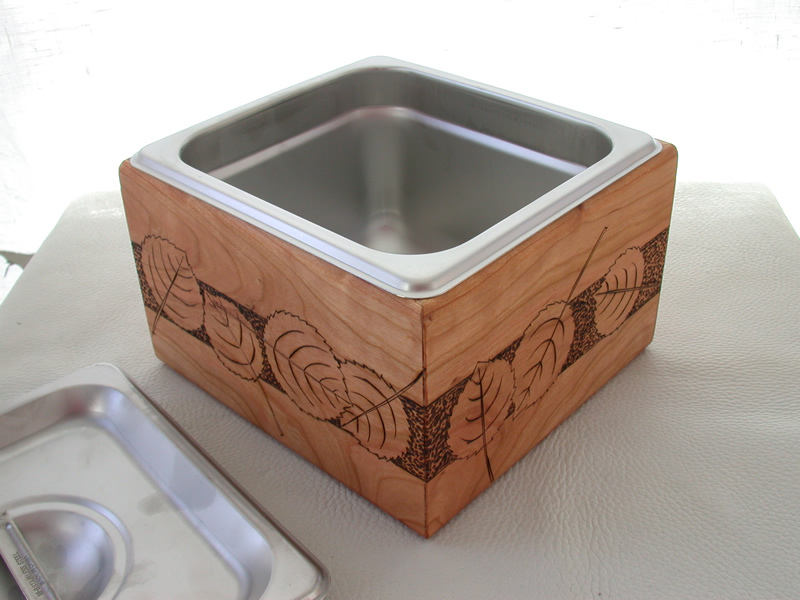 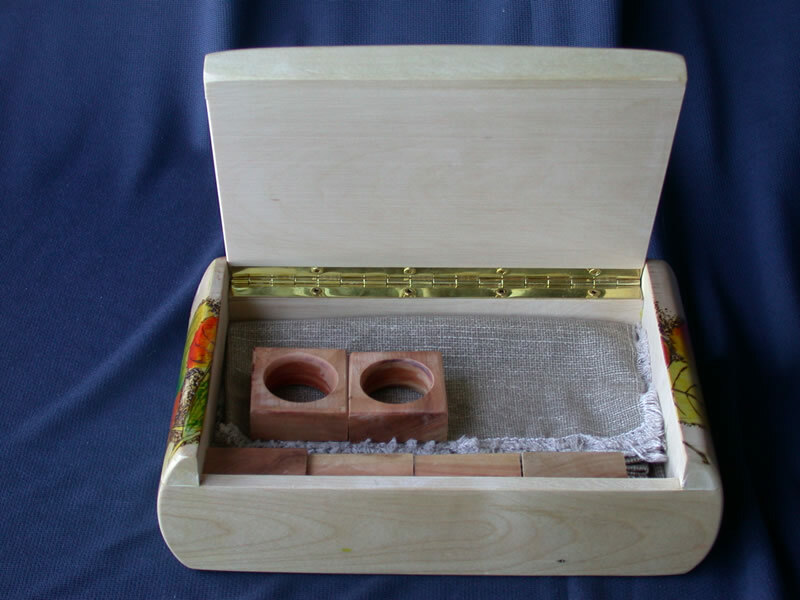 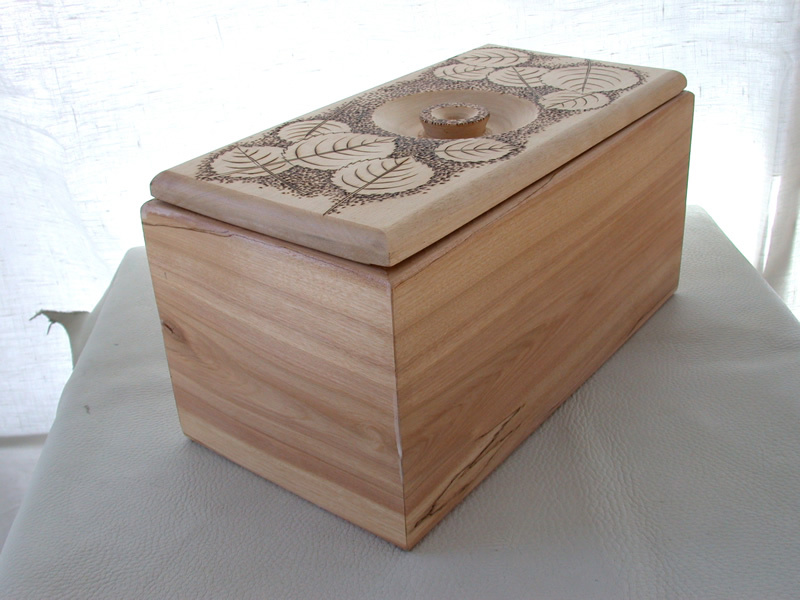 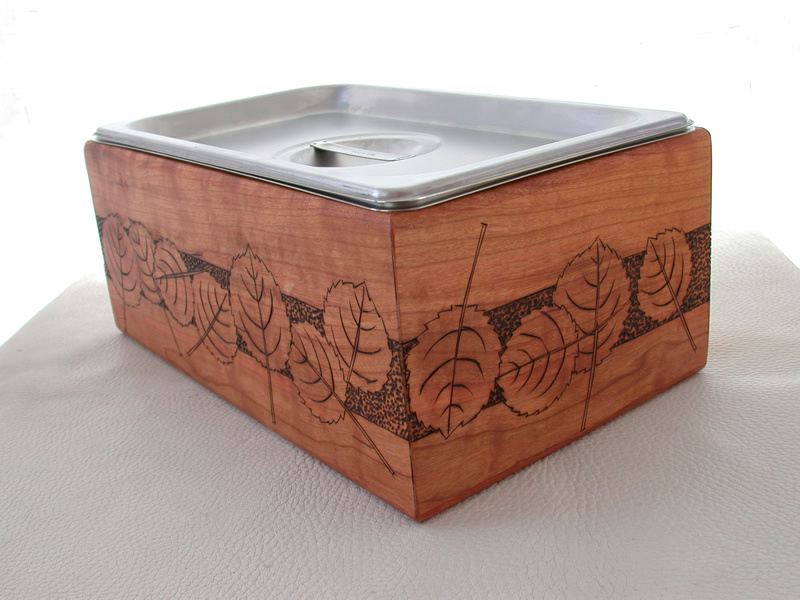 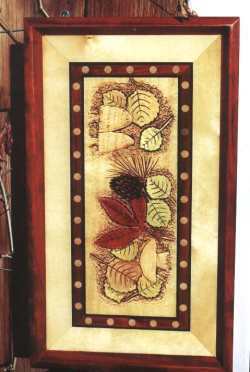 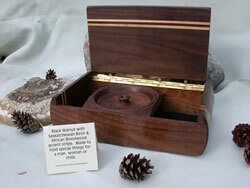 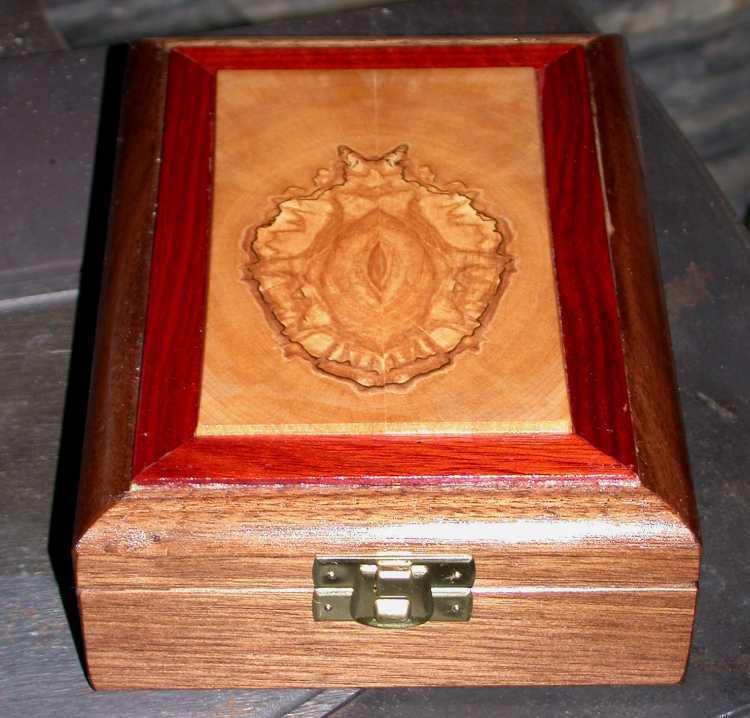 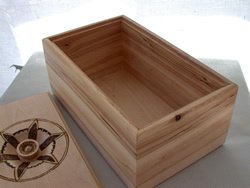 The pyrography decorative elements on these units can be customized for a reasonable additional cost. 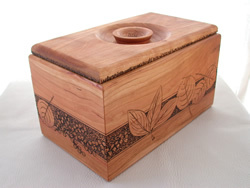 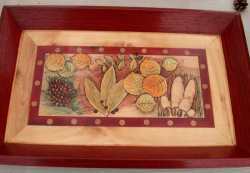 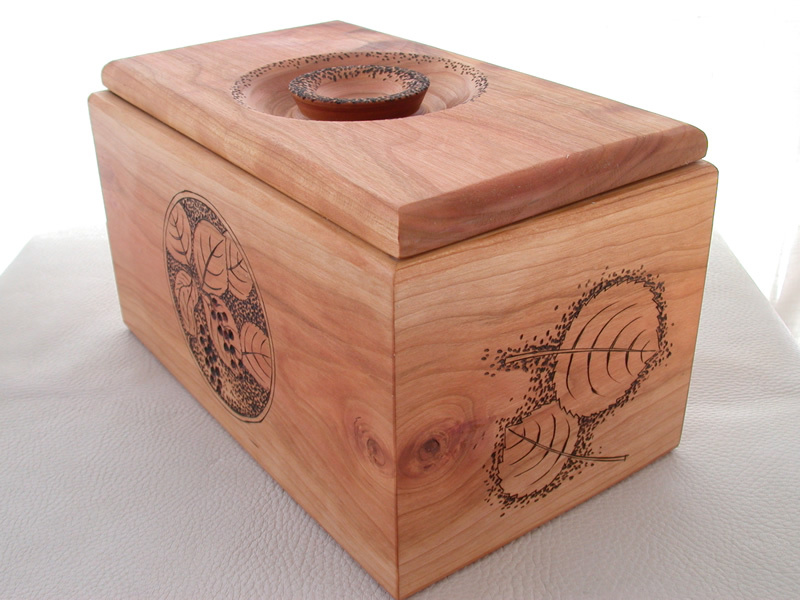 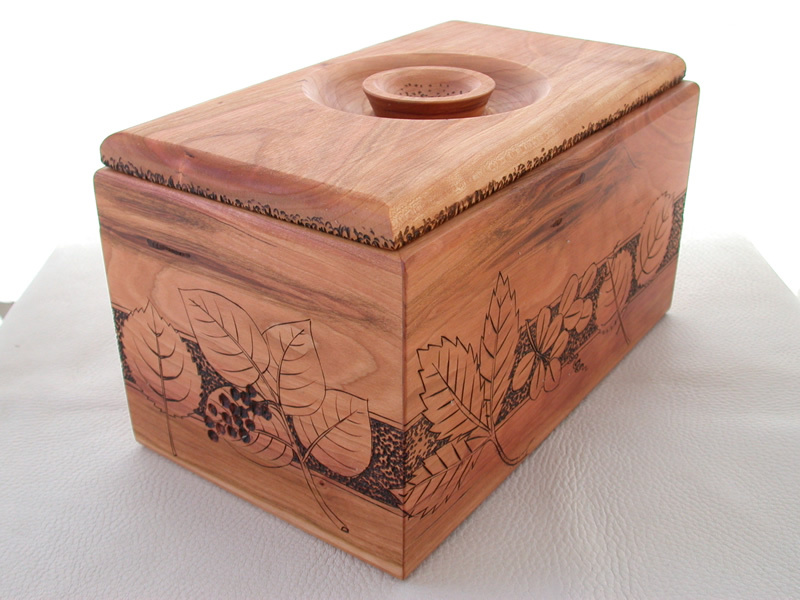 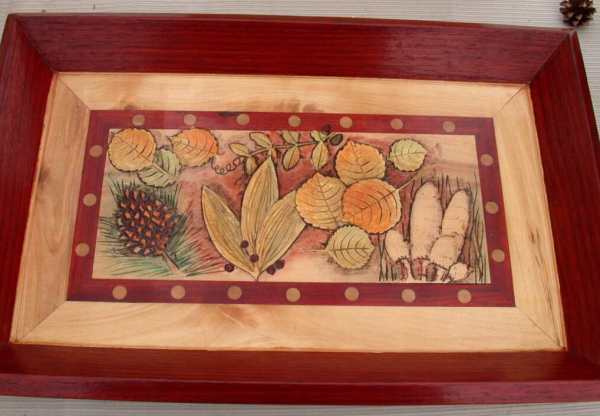 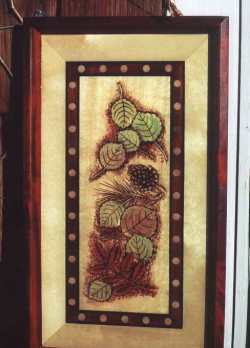 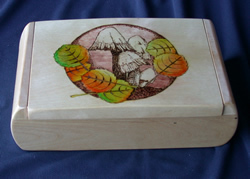 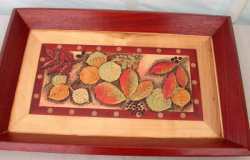 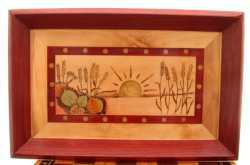 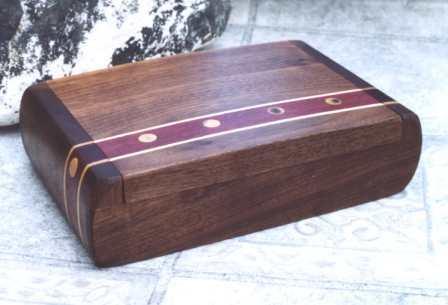 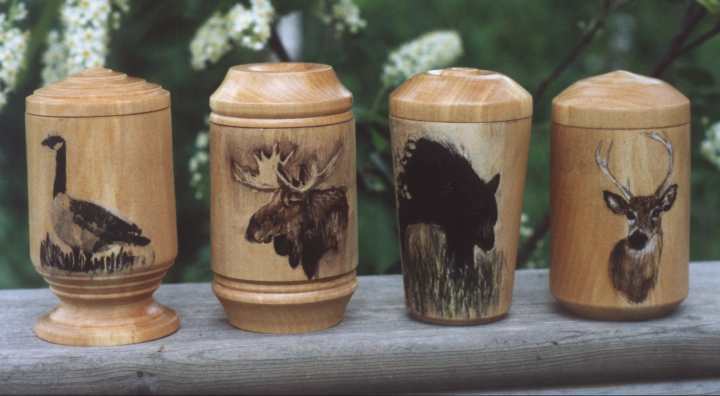 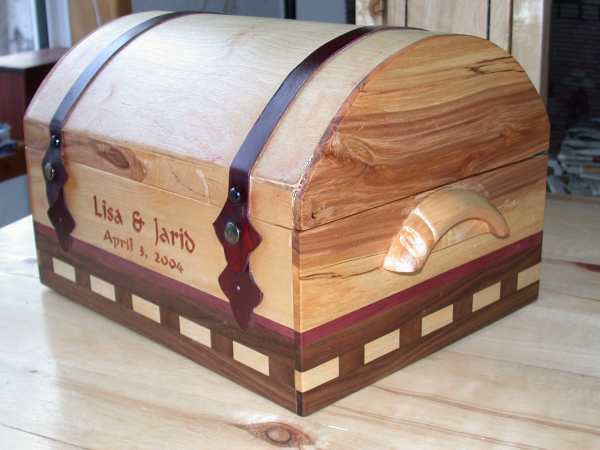 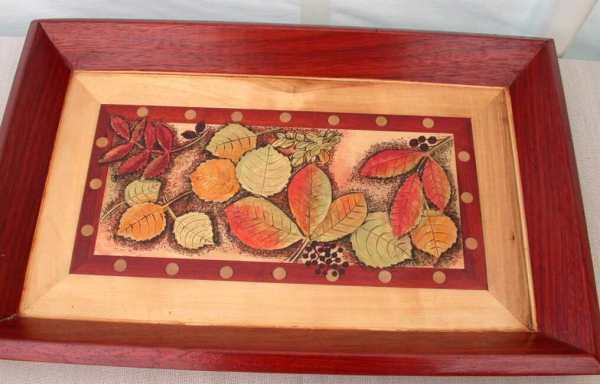 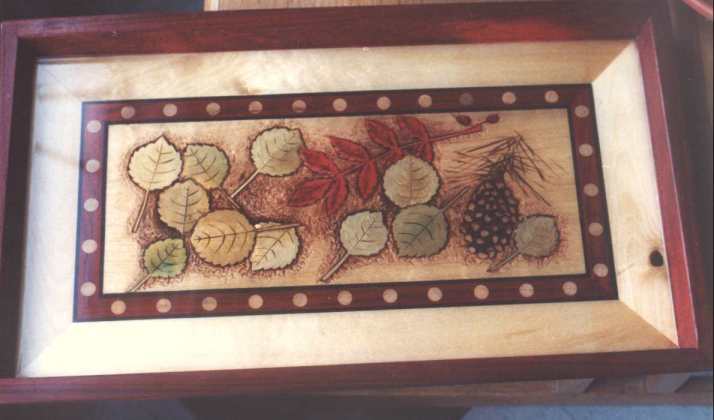 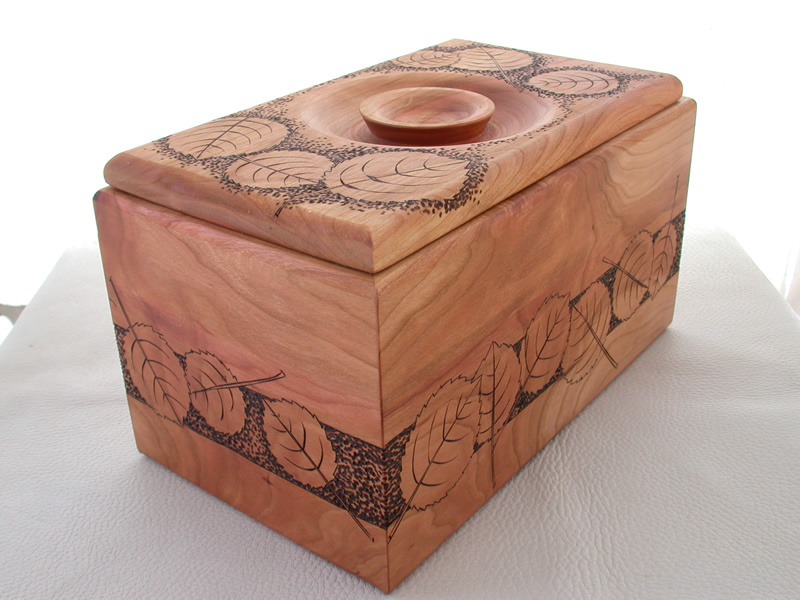 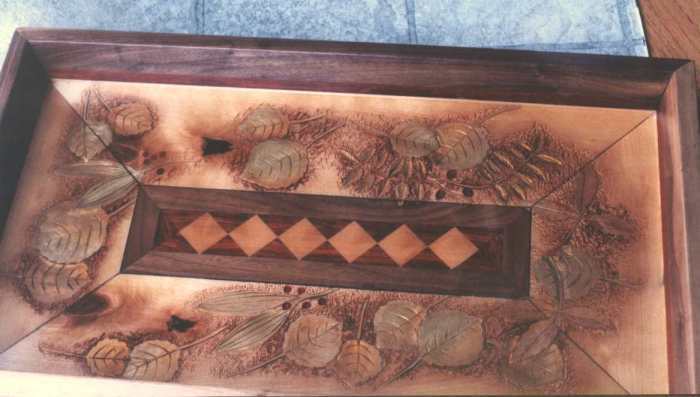 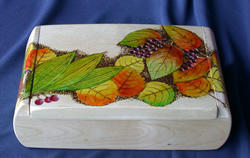 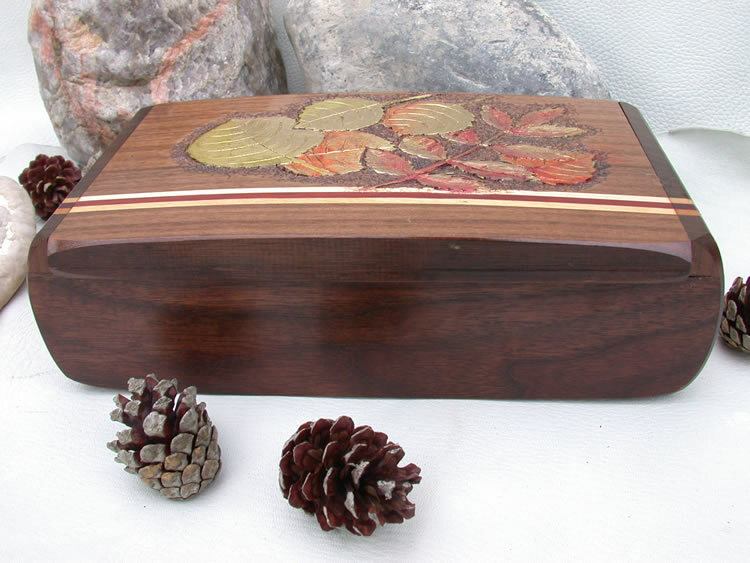 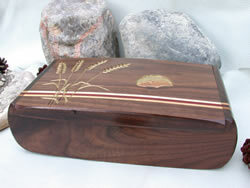 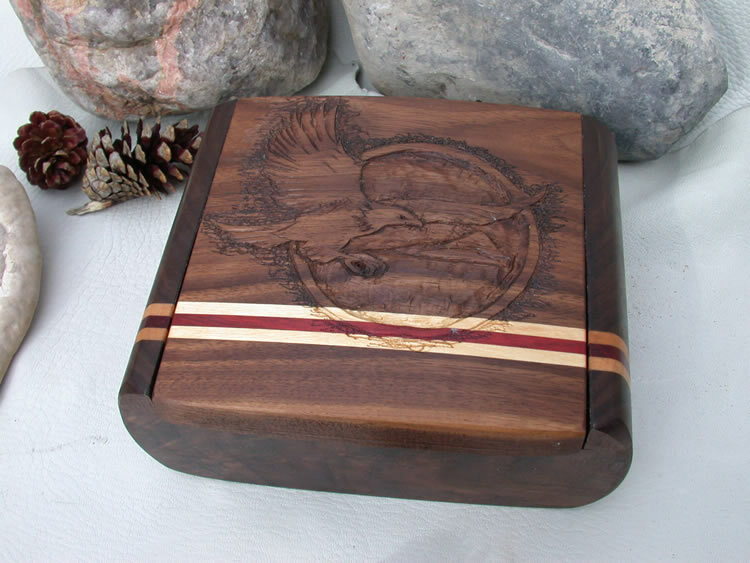 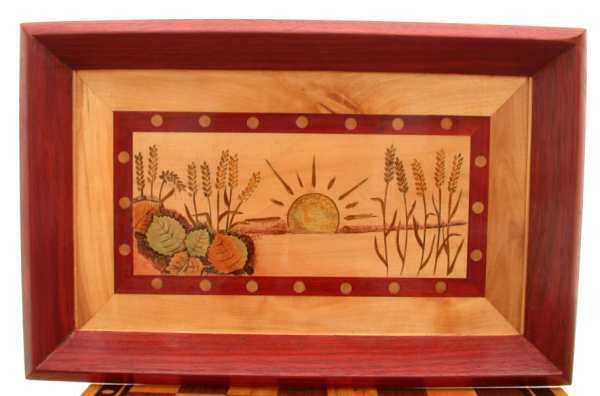 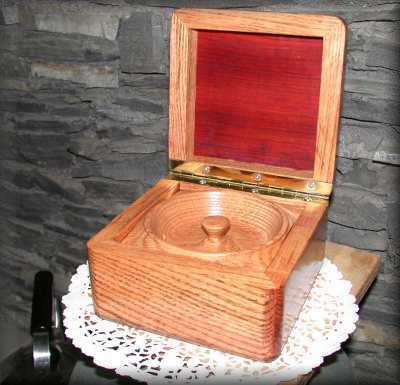 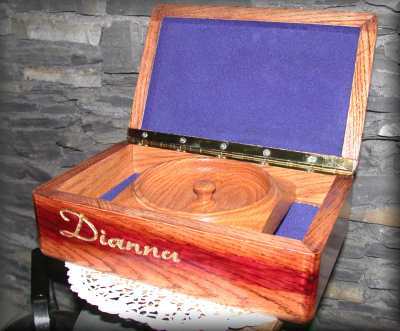 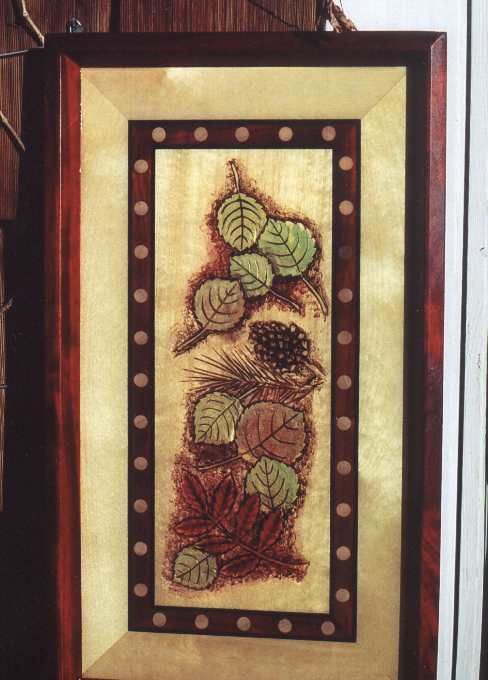 See below for examples of pyrographic decorations added to Cherry Wood units. 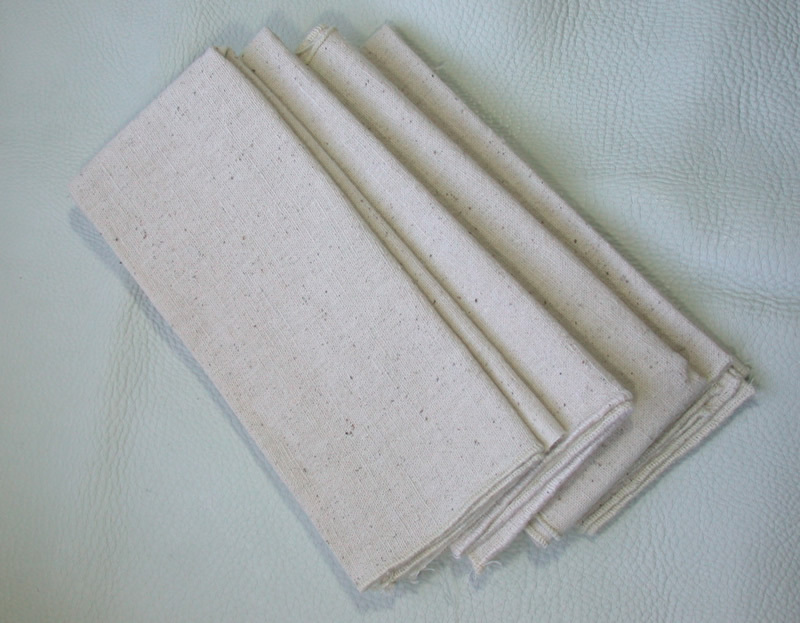 Note as of March 25, 2014: Gerald has obtained heavy-weight 100% Irish Linen fabric in a dark Black Olive and Cloud Cream colours that will also be made into napkins. Images will follow when these are ready. 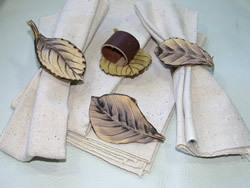 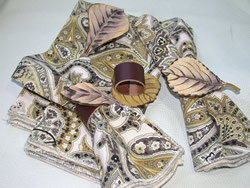 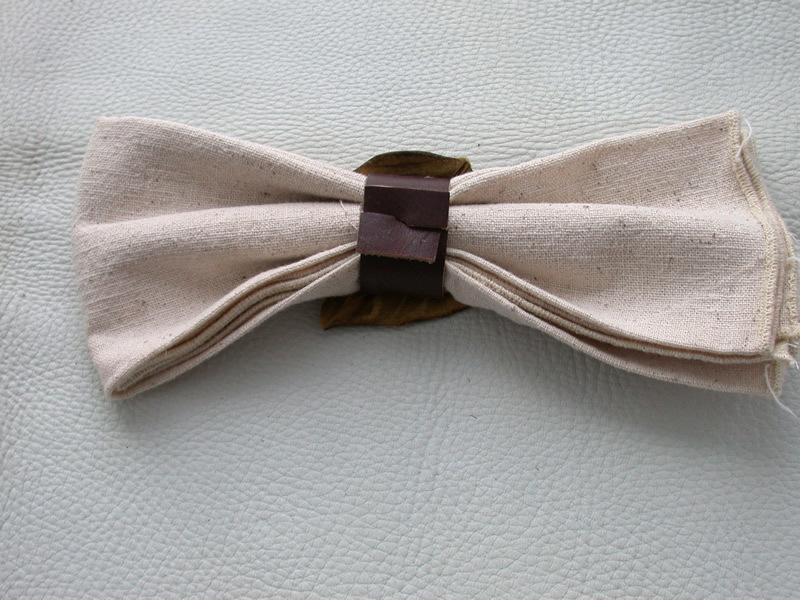 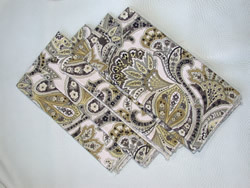 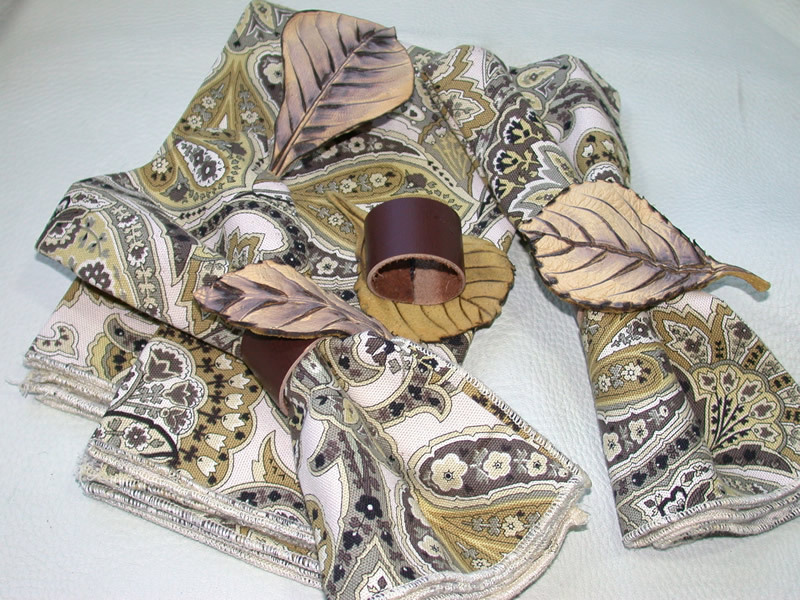 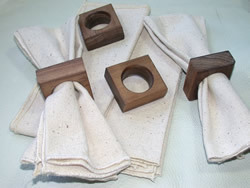 !00% Cotton fabric napkins with hand-made napkin rings available individually or in sets of four. 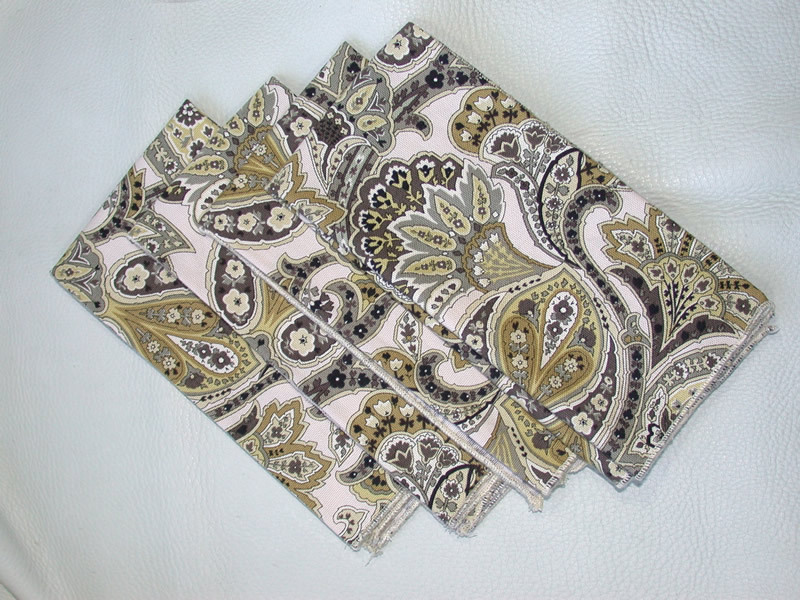 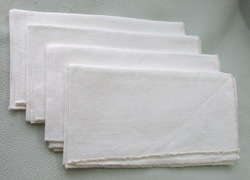 Napkins with design were cut 18" X 18", and are 17" X 16.5" after hemming and washing, and napkins of natural cotton were 17" X 17"cut and are 17" X 14.5" after hemming and washing. 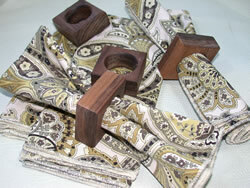 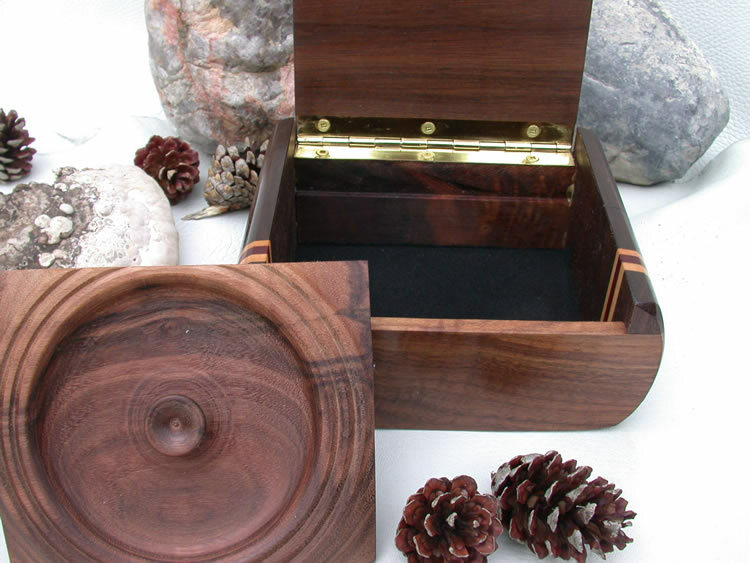 Black Walnut Napkin rings are 2" X 2" X 15/16" with a 1.25 diameter opening. 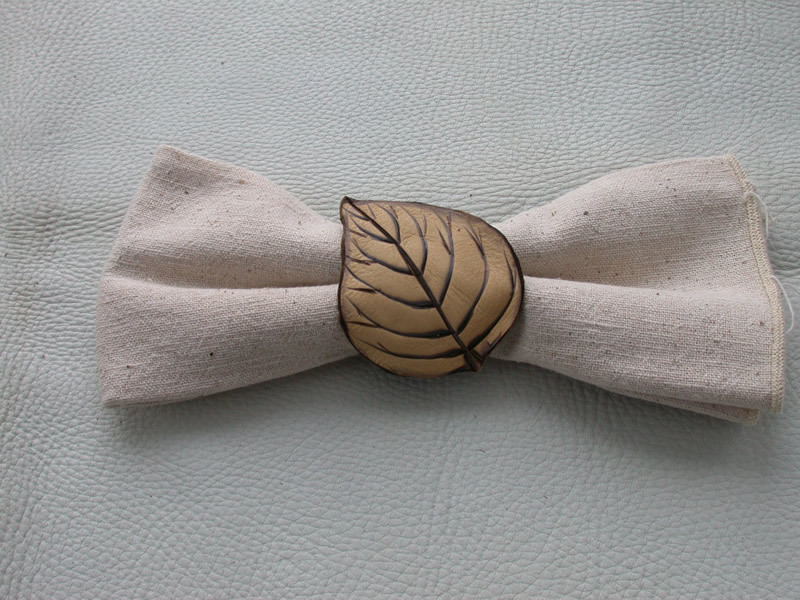 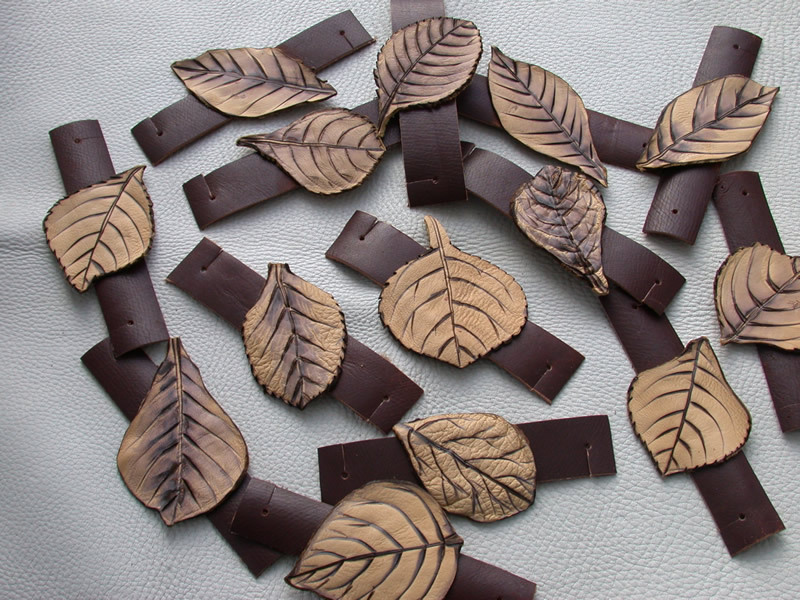 Leather band of 4 3/8" circumference with buckskin leather leaf with pyrographic leaf details added. 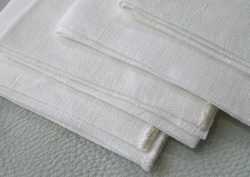 No two exactly alike. 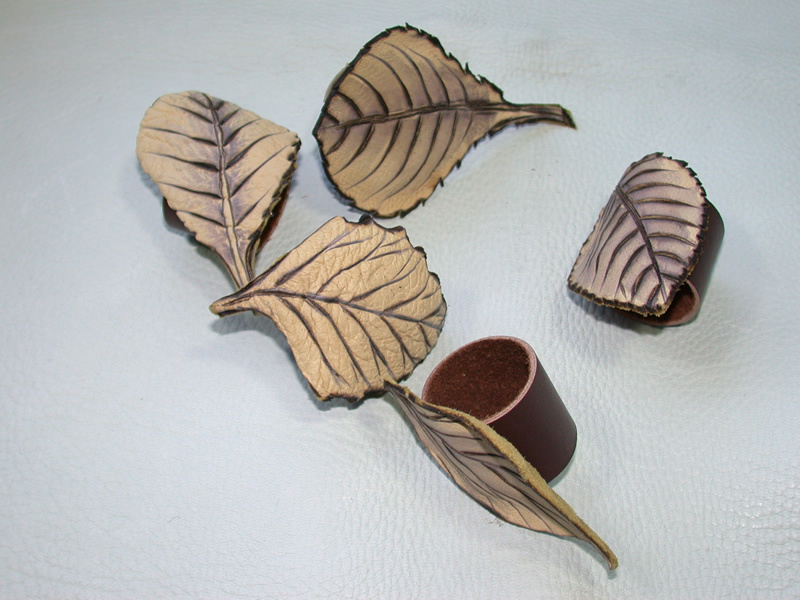 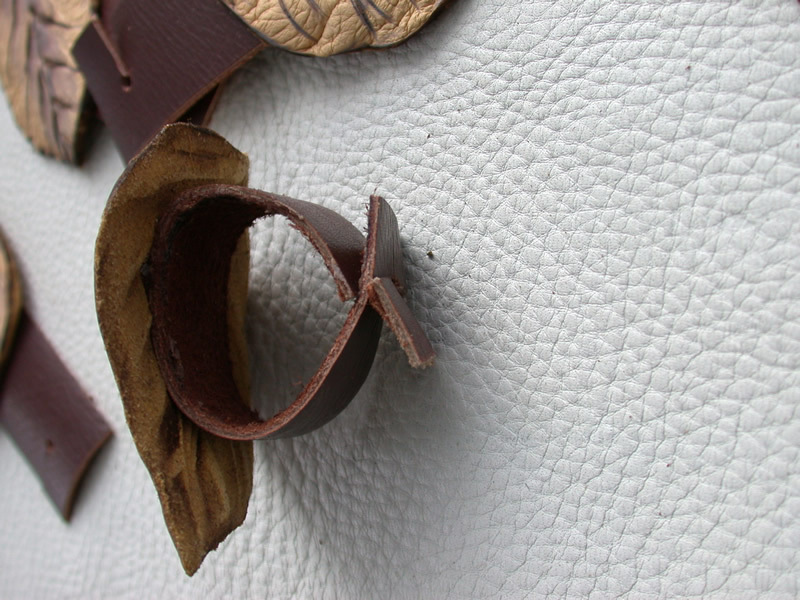 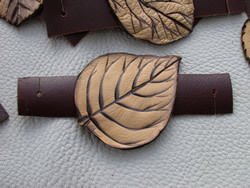 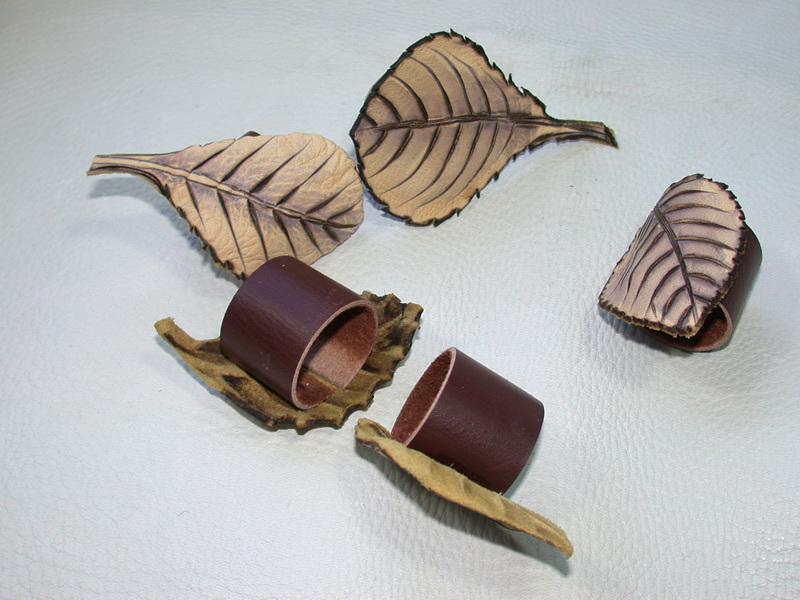 Some of the leaf rings have a full-cicle of leather (left) and others have a slot-tie character as shown to the right and below. 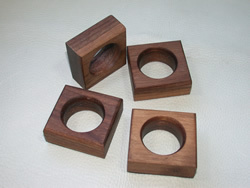 The full circle work best if the fit is not too tight. 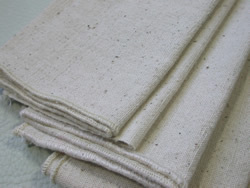 If the fabric bulk is greater the slot-tie version is better. In my judgement the Black Walnut wood rings are more suited to the desgin cotton fabric napkins and the leather leaf are better with the plain natural cotton napkins. 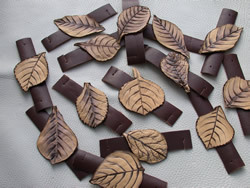 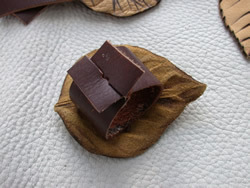 Simple brown-black leather bands without the attached leather leaf are also available but are not shown here as separate items. Napkins made from heavy-weight 100% Flax Linen (7.1 oz. 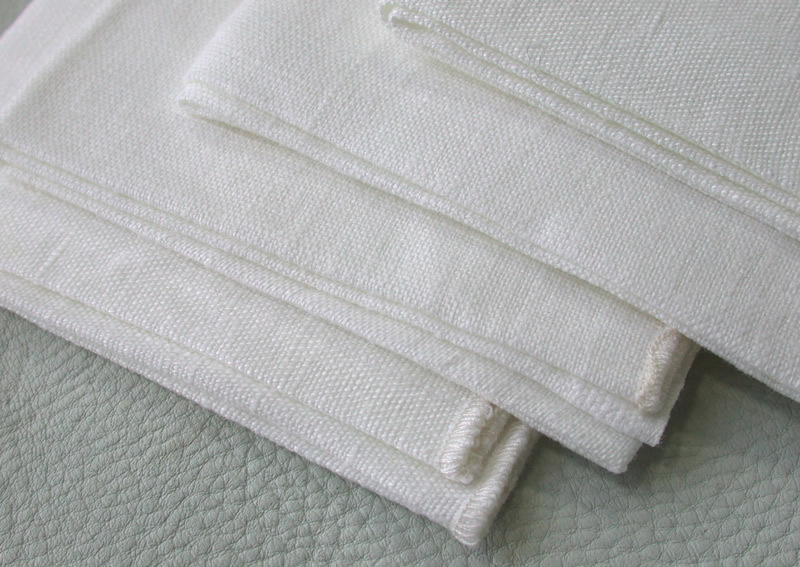 / square yard), 18" X 18" washed, shrunk and serger edged. 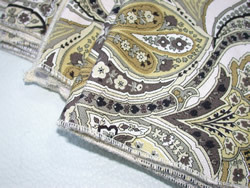 This fabric is on the edge of both rustic and elegant. These Linen napkins sell for $6.00 each. 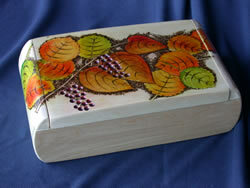 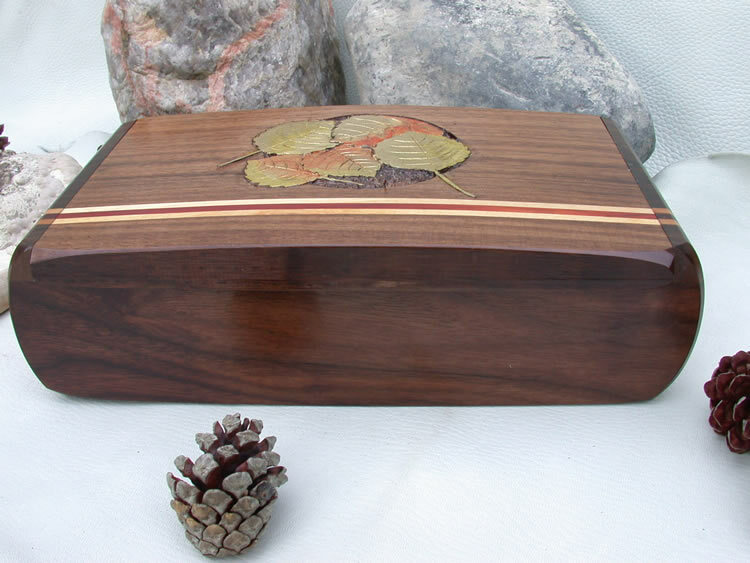 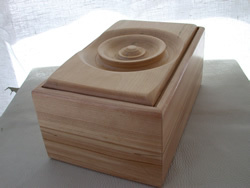 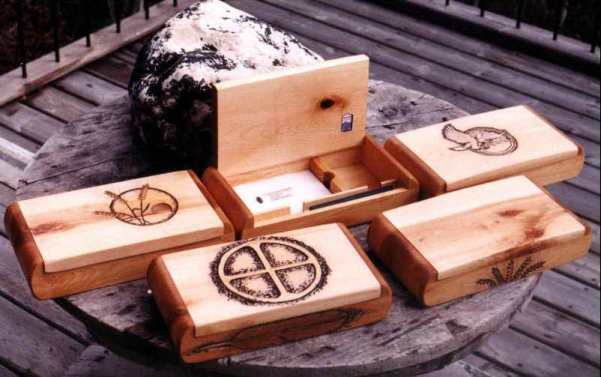 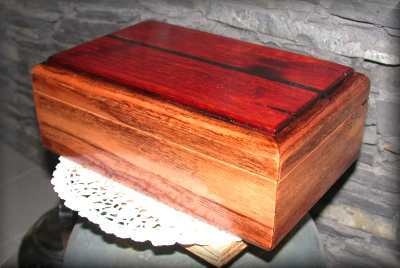 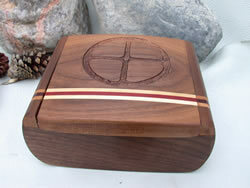 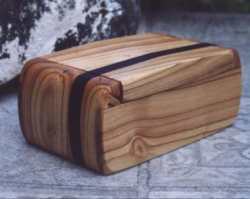 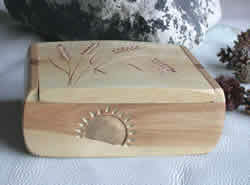 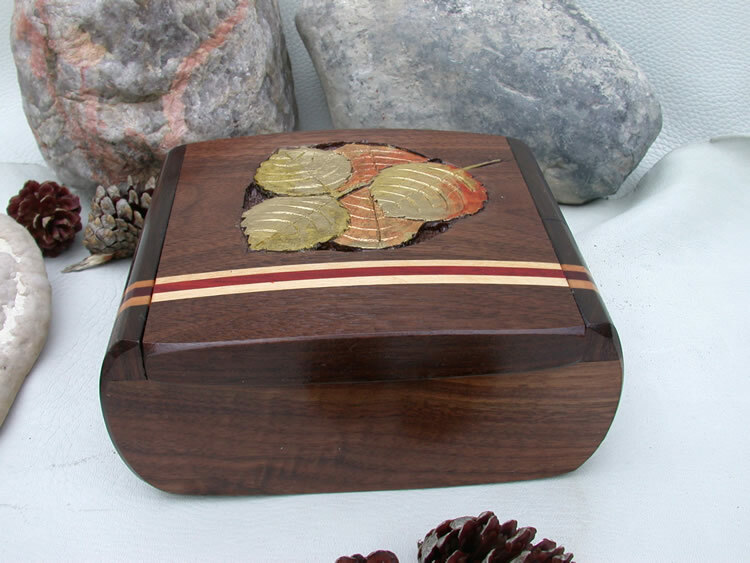 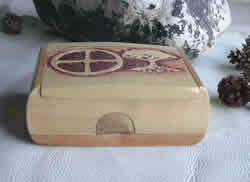 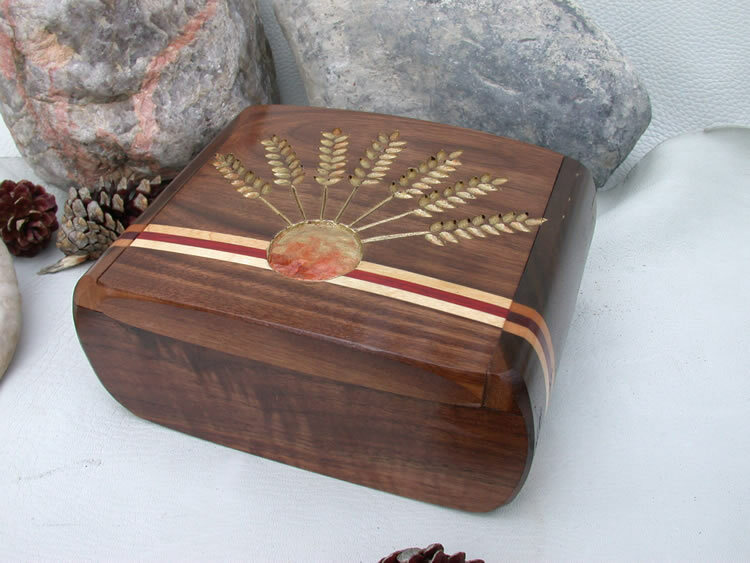 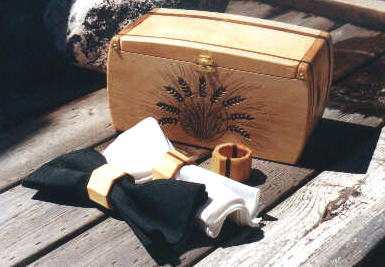 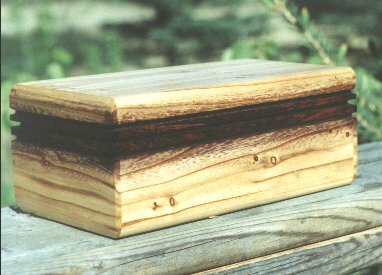 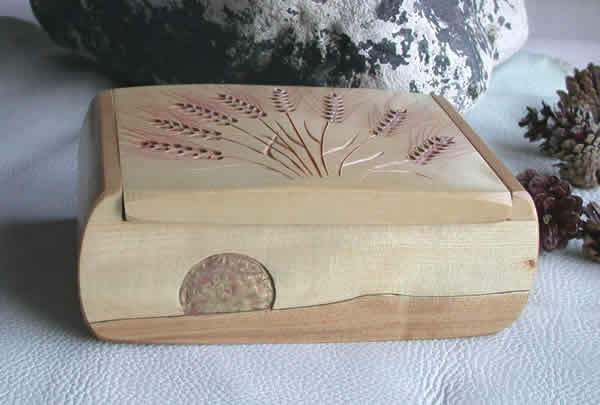 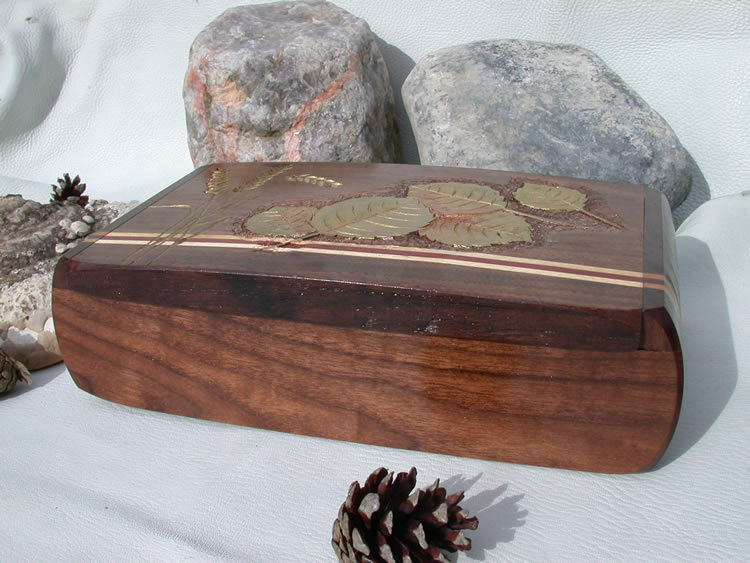 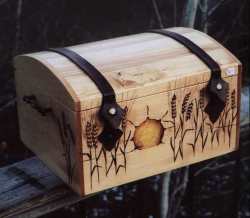 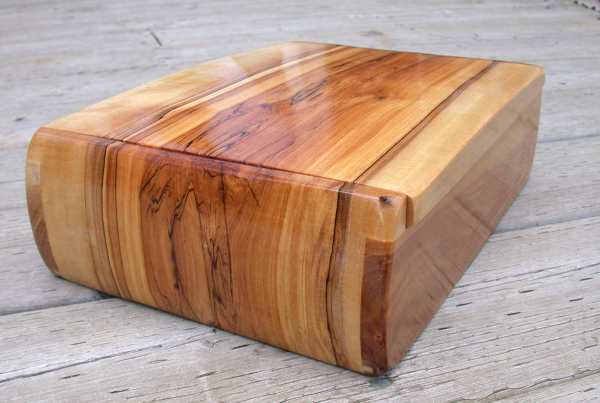 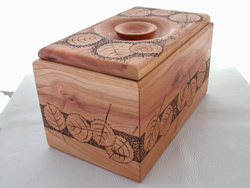 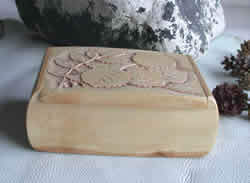 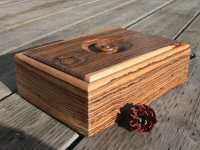 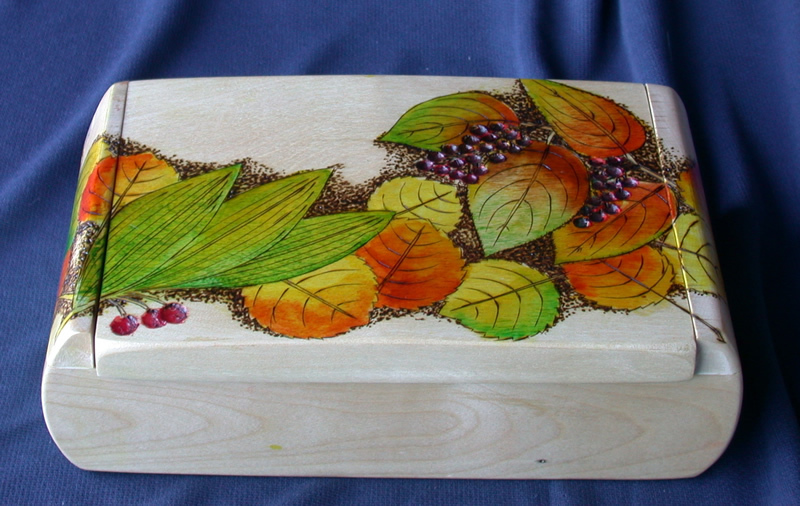 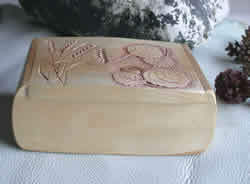 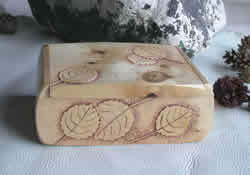 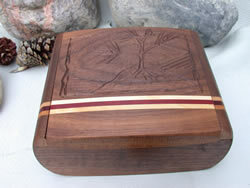 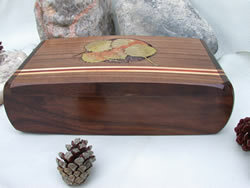 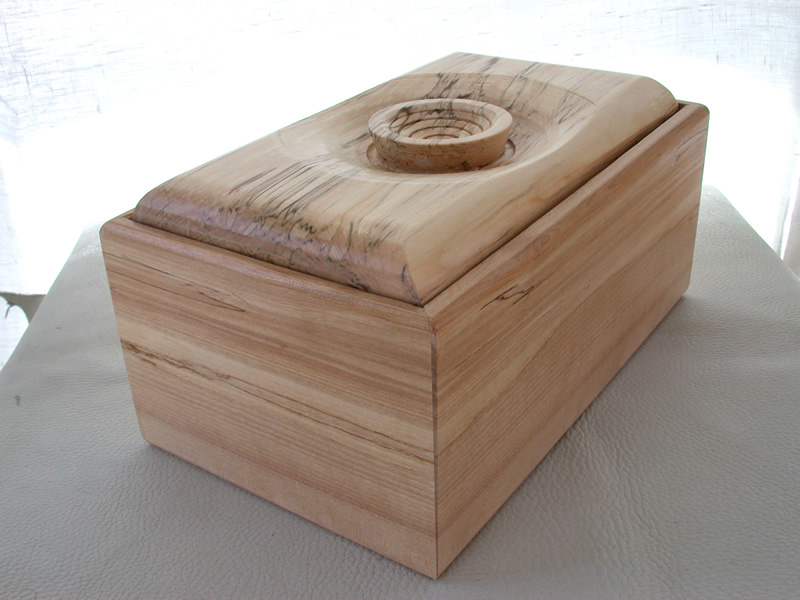 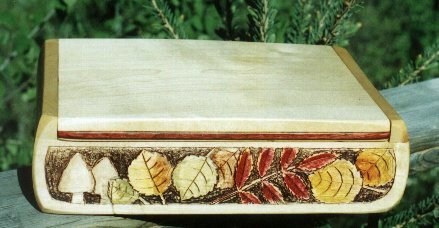 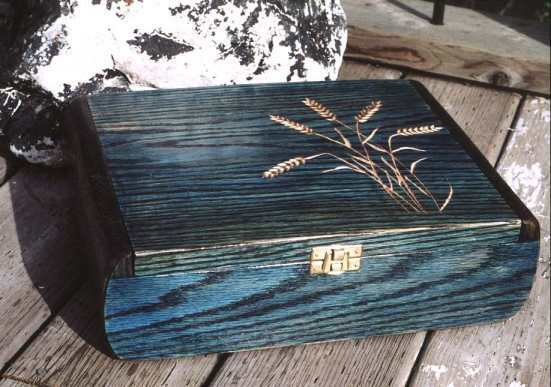 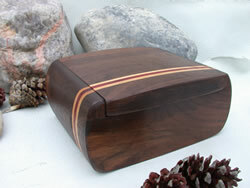 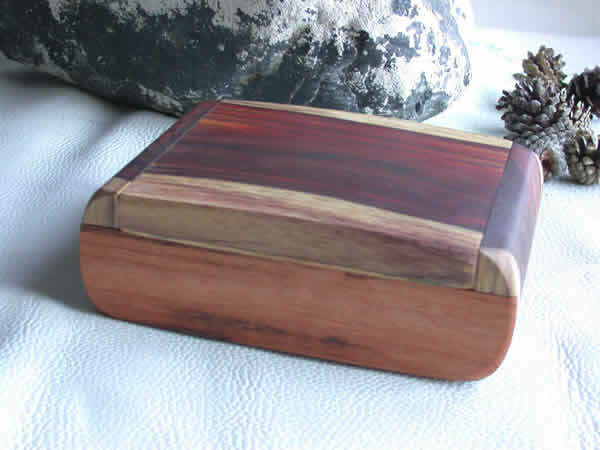 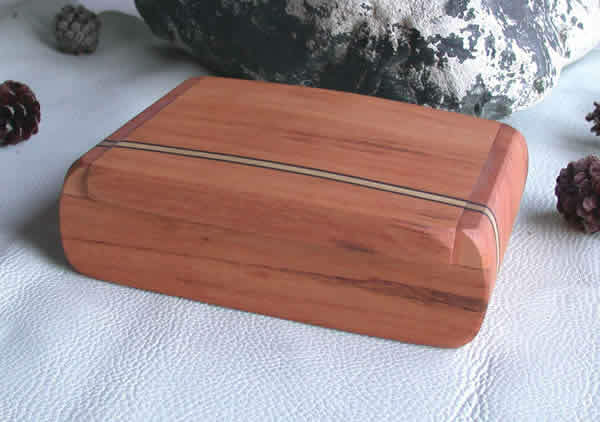 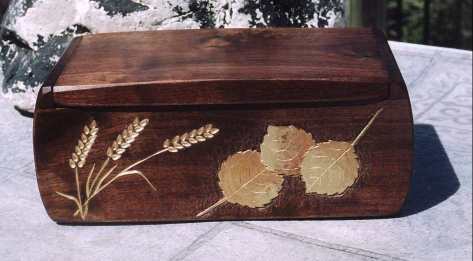 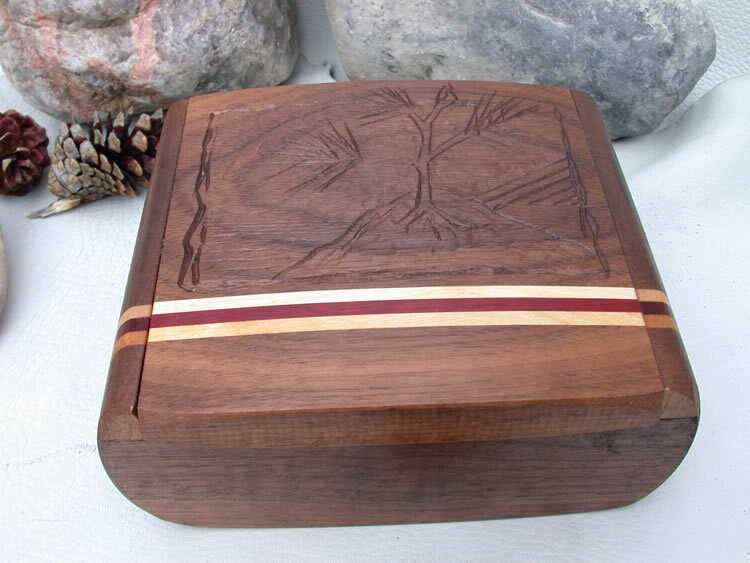 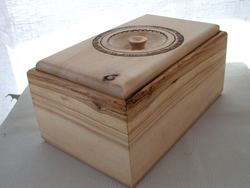 These are a series of boxes in birch wood with leaf / plant decoration burned into the simple, blond wood. I have used aniline dyes AFTER an initial sealer coat of Varathane. 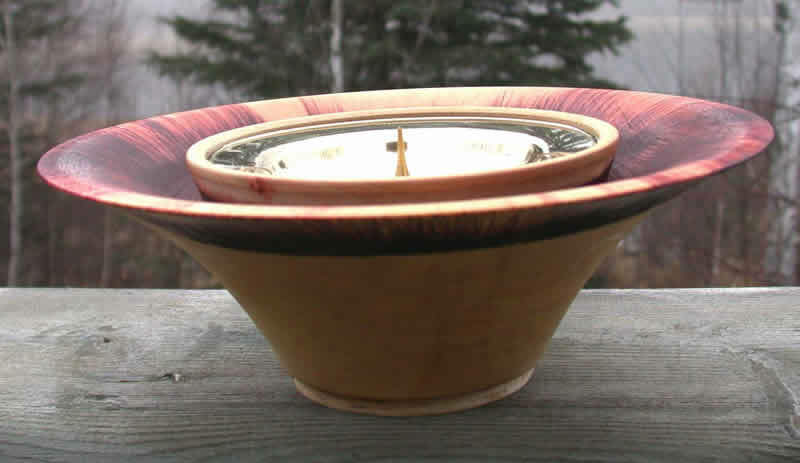 When the wood is sealed the dyes, in a methyl hydrate solution, can be treated much as watercolour paints. 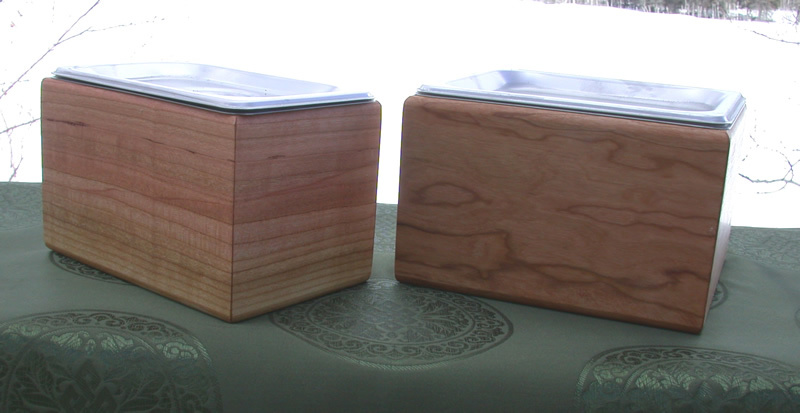 To the right is one of the boxes with the lid opened to show the simple interior. Reference # 2361K, 2362K and 2363K. 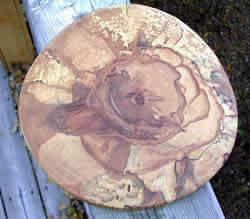 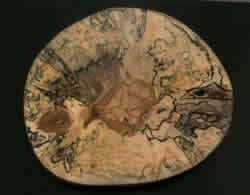 Spalting Birch slice to be used as a trivet that remains on a table even between meals. Take-apart desk top shelf to hold books , CD's etc. 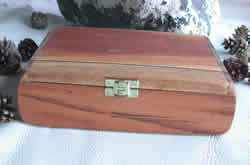 If you wish to find out the prices of these or similar items contact Gerald and make a reference to this page and the image item. 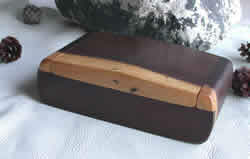 Prices are reasonable and are determined by the cost of materials used and the amout of work required to produce the product. 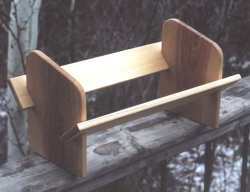 Oak custom stand for Marian statue for a church. 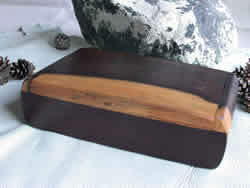 Space was limited and it was to be located in a traffic zone, so a shape that would not snag or block passers-by was important. 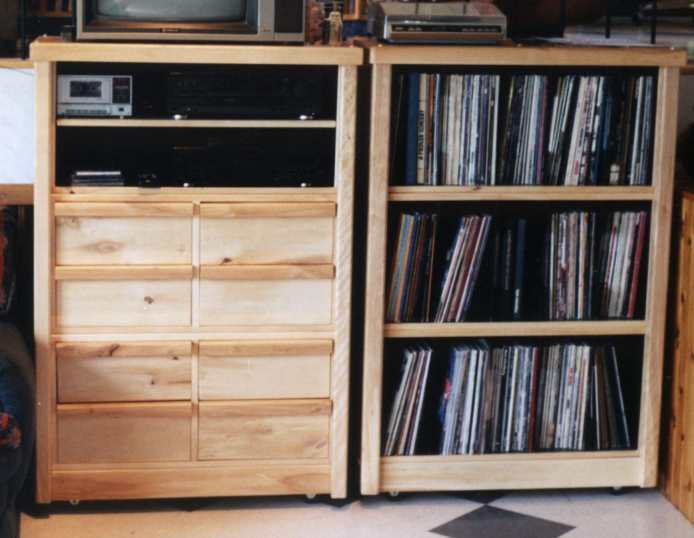 The centre section consists of 4 drawers. 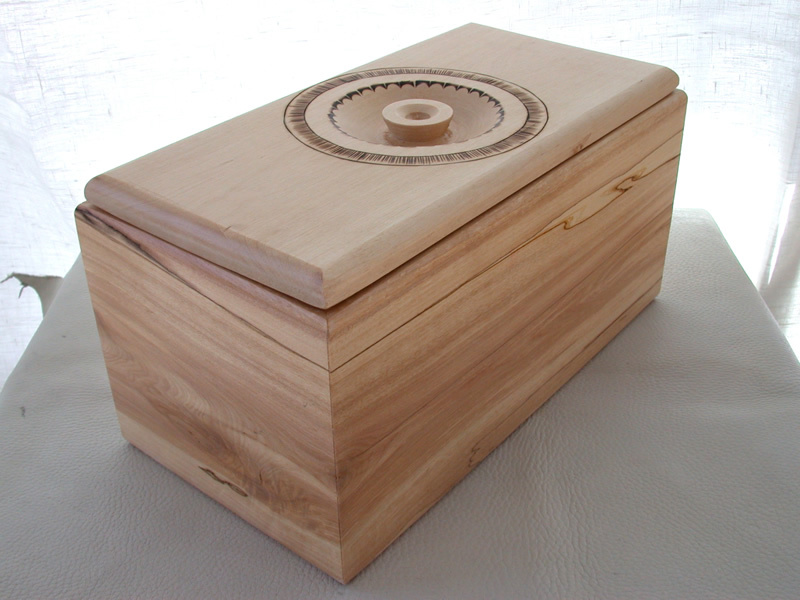 The drawer faces had a knobs turned on their faces and the concentric rings were decorative. The end support pillars are truned birch wood. 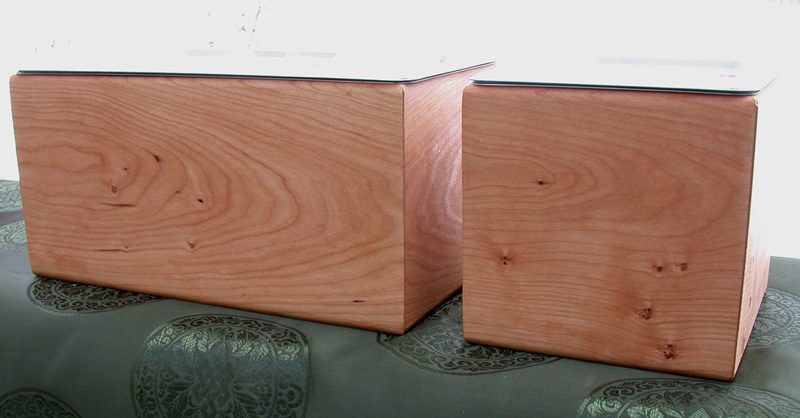 Later another unit was requested along with riser / storage units to be placed below these.